The members of former girl band Mis-Teeq are discussing a possible comeback according to Britain’s Got Talent Judge and Mis-Teeq member Alesha Dixon. The trio split in 2005 after releasing hits such as ‘Can’t Get It Back’, ‘One Night Stand’ and their two highest charting tracks ‘All I Want’ and ‘Scandalous’, which both reached number 2 in the UK. The group enjoyed moderate success with two albums - ‘Lickin’ on Both Sides’, which peaked at number 3 on the UK Album Chart in 2001, and ‘Eye Candy’, which made it to the number 6 spot in 2003. The girls’ final release was a Greatest Hits compilation in the year that they split (pictured below). The group was made up of Sabrina Washington, Su-Elise Nash and Alesha Dixon, with the original fourth member, Zena McNally, leaving in 2001. Alesha has proved to be the most successful, releasing solo singles and albums as well as winning Strictly Come Dancing before appearing as a judge on the same show and then moving on to Britain's Got Talent. Alesha recently announced the possible reunion, “We are speaking and we're having a meeting," she told the Metro before the London audition for Britain's Got Talent on the 20th of January. "It's like all these bands reforming are just jumping on the bandwagon, but I'd be quite happy to go in the studio for a year and just work on a new record. I am so up for doing something with the girls. I have been for a long time. 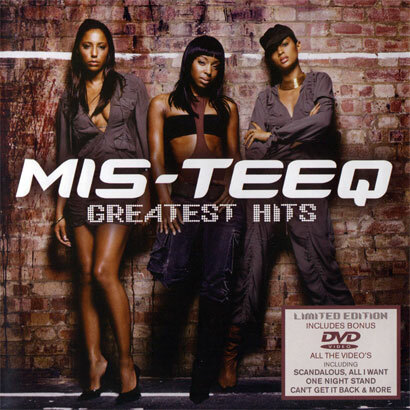 I don't think anybody has actually filled the gap since Mis-Teeq left, which is quite worrying as I thought we were opening doors for people."